You name it, we tested it as possible opportunities to carry future demand and here’s what we found out. Metro is completely focused on safety, reliability, and financial stability. It’s also our job to ensure that the regional transit system improves mobility and connects communities. 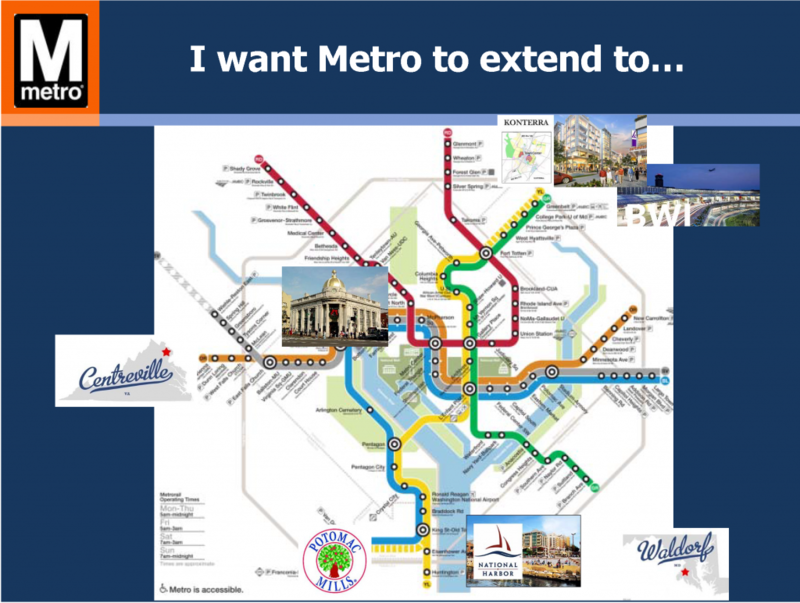 So we’ve had many posts on ConnectGreaterWashington over the last few years describing the importance of a regional approach to transit planning. Posts include FAQs, how different modes compare, the paramount importance of transit-supportive land use, an approach to assessing Metrorail, BRT, and LRT expansion projects, and the overall proposed plan for Metrorail and surface transit to name a few. Finally, we have completed a set of one- to two-page summaries for all the strategies, plans and projects we tested in our evaluation of future needs and opportunities. 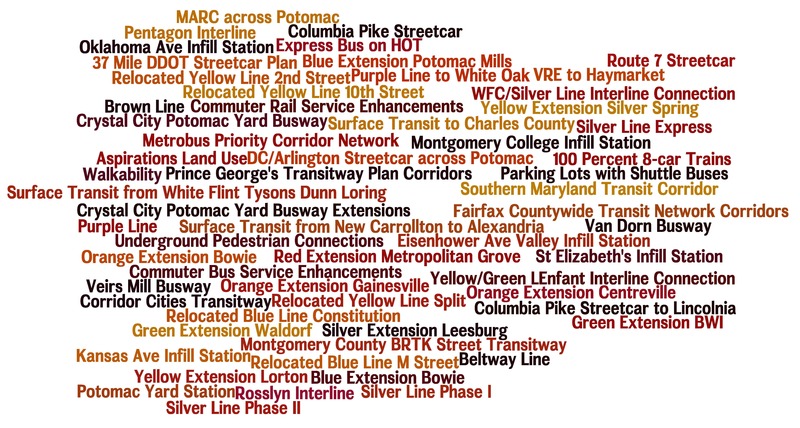 Note, these summaries are inclusive of everything that we analyzed over the course of ConnectGreaterWashington, but only some are recommended to advance. Some strategies were recommended (e.g. eight-car trains), others were not recommended (e.g. Kansas Ave. infill station), while many were partially recommended (e.g. 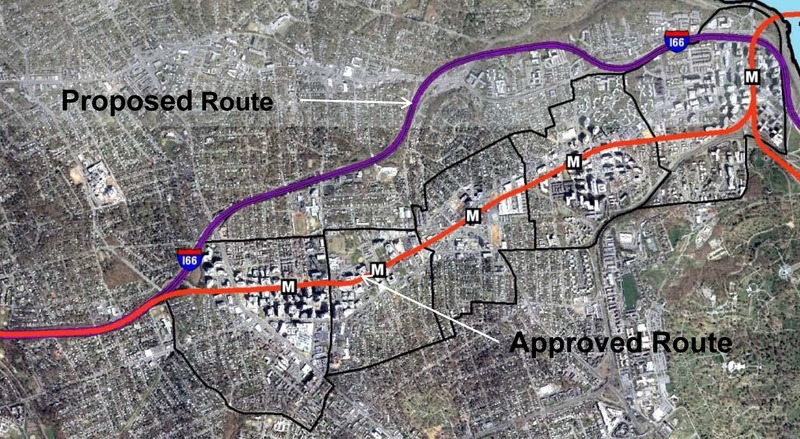 the I-66 corridor beyond Vienna shows promise as bus rapid transit, light rail, or enhanced bus, but not Metrorail unless and until additional housing and/or jobs are guided to the station areas and new Metrorail lines are added in the core). Due to the size of the pdfs, the summaries are divided into three documents. First, are the new Metrorail lines in the core, eight-car trains, and interline connections (pdf updated February 24, 2016). Second, are Metrorail pedestrian tunnels, extensions, and infill stations (pdf updated February 24, 2016). Third, are all of the other modes’ strategies, plans, and projects (pdf updated February 24, 2016). All documents include bookmarks to help you find the various summaries by topic area. As we and the region continue to grapple with today’s safety, operations and maintenance needs, while also planning for future growth, we will continue to refer to the CGW work undertaken to date. Let us know how you can imagine this body of work being used in the future. Transit expansion is in demand but Metrorail, light rail, and other high capacity transit projects can be expensive to build, operate and maintain. With limited resources to invest, our region must ensure that these projects serve the most robust transit markets and are supported by strong transit friendly policies. Informed by our peers and local performance measures, Metro is developing guidelines that the region can use to inform development of high capacity transit projects. As we’ve explored previously, there’s much more to transit expansion than Metrorail. In fact, due to the cost associated with Metrorail expansion along with existing land uses and built environment in much of the region, most of our future high capacity transit projects will be made up of other transit modes. But what is the best way to decide what mode best fits each corridor? The goal of the expansion guidelines is to inform those decisions. Why isn’t Metro looking at a line to [insert address here]? You name it and we tested it as part of our analysis and development of the Regional Transit System Plan (RTSP). Here’s the comprehensive list of what was analyzed. We have received tons of great comments on the proposed 2040 network of Metrorail and high capacity surface transit corridors. Many of you have said that we missed <insert corridor here> or have asked why we don’t have a line to <insert address here>. As part of this plan, we have analyzed almost every corridor or mode that you have identified. However, we recognize that most of it was behind the scenes and is buried deep in our posted presentations to the Technical Advisory Group (TAG). Above is a list of what was analyzed before we unveiled the proposed 2040 Metrorail Network and regionally significant high capacity corridors. Better yet, here is a document that shows the Metrorail lines and other surface transit plans, projects, and strategies that were tested over the course of the project. Everything is listed and where possible, maps and graphics are provided to illustrate what was tested. All tested items were measured against a comprehensive set of measures of effectiveness (MOE). The MOEs assessed ridership, impact on core capacity, transfers, reduction in vehicle miles traveled (VMT), mode share, etc. To wet your whistle, below, check out the Beltway Line that was tested. Only the segments that crossed the American Legion Bridge (between White Flint and Dunn Loring) and the Woodrow Wilson Bridge (between Branch Avenue and Eisenhower Avenue) had some promise and therefore, they continued on in the analysis, though as surface transit not Metrorail. The other segments did not provide good ridership, primarily due to the low densities within a walkable distance from the Beltway, and had little impact on Metrorail core capacity. In parallel with the proposed 2040 Metrorail network, we have identified 25 regionally significant corridors that merit high-capacity surface transit by 2040. Depending on the corridor, high-capacity surface transit can be provided more efficiently and effectively by modes other than Metrorail. The best transit systems in the world are comprised of large networks served by multiple modes. 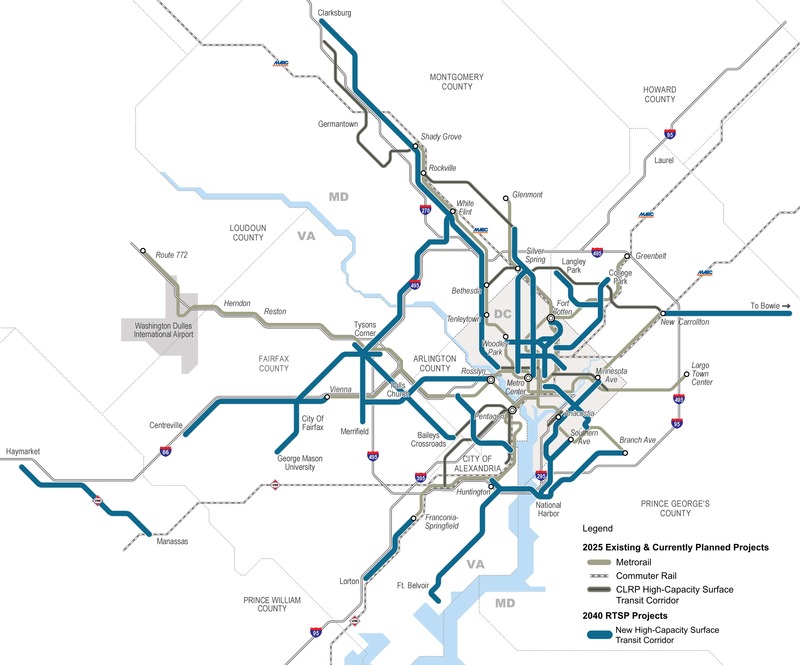 In the National Capital Region, due to the growth and dispersal of activity centers, the high demand placed on Metrorail, and the realities of transit funding, expanding the transit network needs to occur by expanding transit on the region’s roads and highways not just by Metrorail. Metrorail is not and cannot be the best mode for every corridor because the vast majority of corridors do not have the land use, density and ridership to support it. lower capital and operating costs than Metrorail. 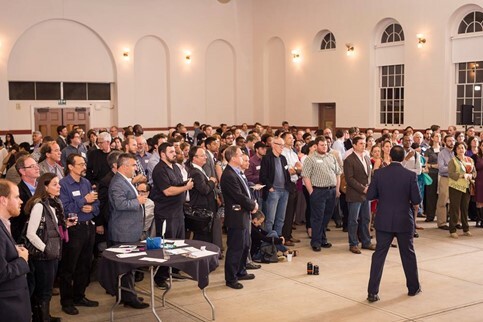 moveDC Public Workshop Announcement – Comment on DC’s long-range transporation plan! Learn more about the moveDC local bus study. Throughout October, you are also invited to participate in a survey to comment on and critique three approaches that have the potential to transform the way people travel in the District. 6:30 p.m. – 8:30 p.m., with a formal presentation 7 p.m.
Visit www.wemoveDC.org for more details and to sign up. October 24, noon – 1:00 p.m.
October 28, 7:00 p.m. – 8:00 p.m.